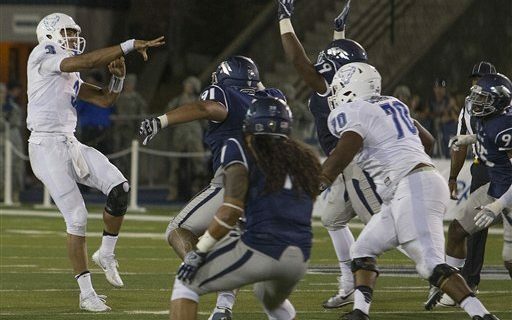 UB quarterback Tyree Jackson is not a product of Cyberdyne Systems. Although if they ever started a franchise with Cam Newton to produce a futuristic, super-sized quarterback, Tyree might be the prototype. With Skynet-like intelligence, a rocket arm and wide receiver speed…all in a six-foot-seven inch, 245-pound package…he’s the perfect weapon to terminate any defense. That’s what makes the UB Bulls quarterback one of the most intriguing athletes in Western New York. Jackson is set to enter his second season as the team’s starting quarterback, but his first as the undisputed runner of the Bulls. In a sport where quarterbacks dominate, the future of the program comes into focus when you look in the huddle. Even from the stands at UB Stadium, Jackson’s #3 (thus the T3 nickname, coined by UB radio announcer Scott Wilson) stands out. There are very few quarterbacks at any level with Jackson’s size. Technically, he’s two inches taller than Newton. That moves him into a special category in the eyes of fans, coaches and NFL scouts. The “Wow” category. That’s what brings on the inevitable comparisons to the Carolina Panthers star. “He’s a great player. But I look at all of those guys and mimic stuff from all of them-Tom Brady, Phillip Rivers, Aaron Rodgers-you can take piece of everyone in the NFL,” says the native of Norton Shores, Michigan. But yes, he watches Newton and knows there are lessons to be learned from one of the few super-sized QB’s in the sport of football. Tyree was only five-foot-nine inches tall as a high school freshman on the shores of Lake Michigan, near Muskegon. That big jump in height, a school without much tradition for winning (until he got there), and a senior year knee injury scared away some of the big colleges during the recruiting process. UB’s previous coaching staff stuck with Tyree, and he stuck with the school that wanted him the most. After taking over as the starter during the season opener last year, the job is Jackson’s. He has spent the off season learning what it means to be a quarterback. That goes beyond running the plays and finding the open receiver. It means becoming a face of the team. Jackson was one of two Bulls to attend the Mid-American Conference media day in Canton, OH at the Pro Football Hall of Fame. While that’s not unusual for a quarterback, it’s a bit unusual for a sophomore. Tyree knows he has to be a leader for the Bulls. That’s what quarterbacks do. He has good mentors in Head Coach Lance Leipold, quarterbacks coach Jim Zebrowski and former teammate, Bulls great Joe Licata. The Bulls are settling in for their third season under Leipold. That means more familiarity with the program, schemes and expectations. That also means less roster turnover, and a higher overall comfort level. That’s what usually leads to more wins. At times last season, Jackson forced throws and made bad decisions. Expected for a first year, redshirt freshman quarterback. Cutting down on those mistakes, and using his immense skills, are the goals for 2017. If they do, and if Tyree Jackson plays like the larger-than-life quarterback he is, then college football will have a new blockbuster hit.